DIFFICULTIES AND DISASTER are not pleasant things to contemplate or write about, however after attending Randwick City Council’s workshop for local government and community sustainability educators with David Holmgren in September 2009, it appears that the topic is one now worthy of a little contemplation. David is known as the co-originator, with Bill Mollison, of the permaculture design system. In broad terms, permaculture is a type of nature-assisted-design for sustainable living. His Future Directions workshop, titled after his new book of the same name, engaged participants in thinking about the challenges we face in a future in which the impacts of climate change and peak oil will figure strongly. That future will be our grandchildren’s reality. It wasn’t that David was predicting disaster. What he was saying was that our societies may go through a period of stress brought on by climate change in combination with peak oil, and that this will bring profound changes to the way we live. Food production could be one of those challenges. What would cause a food shortage? The conversion of open space and parkland to food production would form part of the scaling-up of urban foor production as crisis response. to transport food to the cities. Were there to be some disruption to the supply of oil, even the increasing price rises that would come with the peak oil scenario, then we may find that our food has become very expensive and that shortages could occur. Then there’s the still-unknown impact of climate change, with its shifting rainfall patterns and water shortages in some places. The use of urban wastes, such as using waste newspaper as a mulch, would increase with any boost to growing food in our cities. 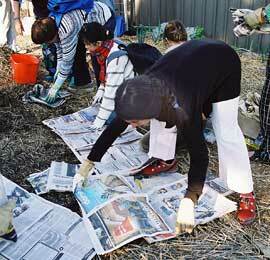 Photo: Russ Grayson — Randwick City Council Sustainable Gardening course. international conflict that could threaten international trade in food and its importation. Those long, refrigerated semi-trailers that we see on the highways and pulling into supermarket loading bays are a sign of how transport-dependent our urban food supply has become on oil-powered transportation and the movement of foods across the country. Disrupt that food transportation in some way, and what happens? It has been claimed that Australian cities have maybe five or so days of food on the supermarket shelves — providing there is no panic buying. That’s better than the UK which has a mere two or three days supply. That was shown some years ago when food transport drivers in the UK went on strike. Obviously, ours is a very vulnerable food supply. Scaling-up the production of compost as fertiliser would be a need in responding creatively to any food crisis or shortage. This got me to thinking about the role community gardeners could potentially play in any long-term disruption to the urban food supply. The first thing to realise is food shortage has happened before — during World War Two. 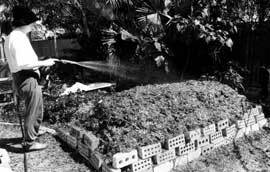 Faced with the need to secure their food supply, citizens in the UK, the USA and other countries were encouraged to grow food at home and wherever they could. Urban parks and vacant land were taken over and lawn was replaced by turnips, potatoes and other foods to feed the populace. The cities started to feed themselves in what became a government-encouraged, large scale, popular adoption of gardening. City residents became city farmers. 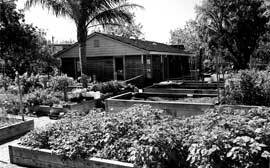 Clearly, the Victory Garden initiative is a model that we could learn from and possibly replicate were there ever the need to do so. But how would we do this? Increased recycling of materials for garden construction would be part of enlarging the urban production of food in a period of prolonged shortage. Faced with any long-term disruption to our urban food supply, the replication of the Victory Garden model would call for a massive scaling-up of community and home gardening. Community gardens would be scaled-up mainly by replication — by multiplying the number of community gardens — rather than by enlarging existing gardens. This would be due to limitations on size in many of the existing gardens. But where would the gardening skills demanded by so many new to gardening come from? The potential here would be for many of those presently engaged in community gardening to provide training services to new community garden start-ups. That’s one reason why the offering of training workshops to existing and to new community gardeners is important in introducing and maintaining skills. Water gardens would be an additional source of food in the city in adapting to any shortfall of supply. 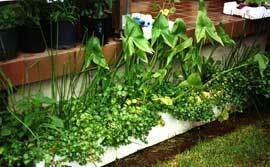 Here, waste foam fruit boxes have been repurposed as water gardens containers to produce edible arrowhead, duck potato, watercress and water celery. Clearly, any significant scaling-up of urban food production in the face of some long-term crisis creating a food shortage would call for the production of greater quantities of organic matter, such as compost, and for the harvesting and storage of greater volumes of rainwater for garden irrigation. 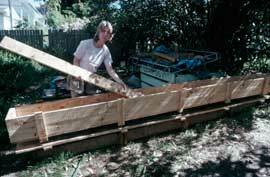 examples of water harvesting and storage include the use of tanks — some made from disused (and clean) 200 litre steel fuel drums and plastic olive barrels used to import preserved vegetables and fruit; there are also earthworks, such as those that create permeable soils, and the excavation of swales across the contour of sloping land to detain water running off downslope and allowing it to infiltrate the soil profile. Community gardening is providing the skills and know-how that would be essential in adapting to some future food shortage. The experience gained through the process of community (and home) food production would be essential to an intensive, urban food production system that aimed to increase urban food security. This brings to community gardening an added benefit to societies, as a training ground for those who would move out to assist some future influx of would-be urban food producers. As such, local government and community organisations might enable the acquisition of the do-it-yourself skills that would enable a scaling-up of the area under urban food production and a skilling-up of citizens to become more a likelihood than a possibility.